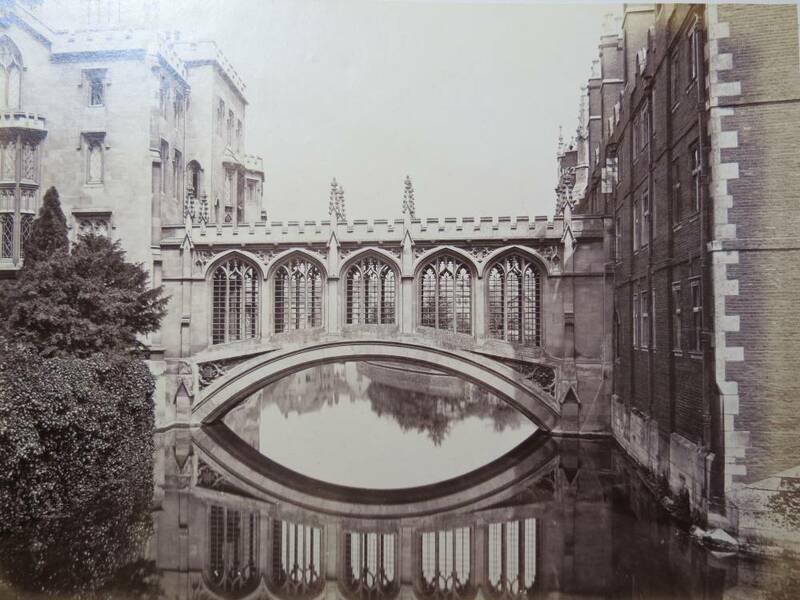 Bridge of Sighs, St. John's College, University of Cambridge. Architect: Henry Hutchinson (1800-1831). Photograph c. 1870. Albumen photograph, approximately 6 x 8 inches. [Click on photograph to enlarge it.] This is one of 58 photographs of Cambridge University taken for a William Winfield c. 1870 and assembled in an album now in the possession of New Boston Fine and Rare Books, which Kimberly Blaker, President of the firm, has kindly shared with readers of the Victorian Web. Bound album of 58 original albumen photographs of Cambridge University. Oblong 4to, full gilt-stamped black morocco leather, bound cover has scuffing and is worn heavily at hinges. Four raised bands and gilt stamped borders. Detailed gilt stamped decor on interior cover edges. Blue silk endpapers in very good condition. E. G. Bookplate of Clifton Waller Barrett tipped in front end sheet. New Boston Fine and Rare Books.